I spent last weekend in the mountains of North Carolina where the autumn weather is a little ahead of ours in Atlanta. As I drove along the beautiful, scenic mountain roads, I passed countless apple orchards all competing for my attention. As I thought about the first bite of a freshly picked apple and the explosion of flavor in my mouth, I relented and wheeled into Justus Orchards. When I entered the store, the aroma of freshly baked apple pies and donuts permeated the air. There’s this thing called Pavlov’s response, and I had one! I made a beeline for the warm apple cider to complete the sensory apple overload. It was at that moment that I fully embraced the arrival of fall. As I wandered through the store, I saw bags and bags of every apple variety known to man. For the full experience, customers have the option of picking their apples. I couldn’t leave the store without a bag of honeycrisps, so I made my purchase and continued my drive along the windy, curvy roads back to Atlanta. I spent the next three hours pondering apple dishes and how to put the shiny orbs to good use. 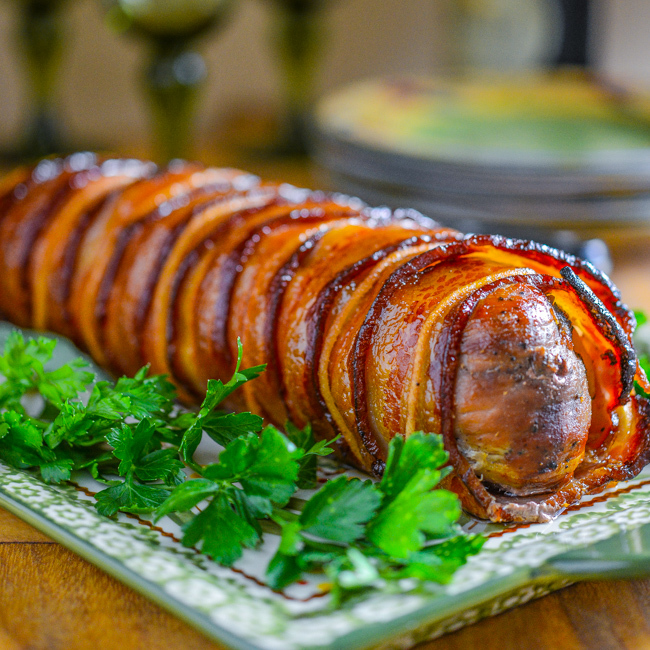 You should know by now that I love all things sweet and savory and by the time I arrived back in Atlanta, I had settled on a pork tenderloin wrapped with bacon and apple. A maple and apple glaze would give this dish the finishing touch. I only achieved moderate success with my first attempt, but after some experimentation, the second version yielded a better result. I devised a relatively easy way to wrap the tenderloin. Step 1: Cut 8 14-inch lengths of kitchen twine and place them an inch apart on a 15-inch piece of plastic wrap. Step2: Place roughly 12 slices of bacon (1 pound) in an overlapping fashion on top of twine. Step 3: Top the bacon with thinly sliced apple. Step 4: Place the seasoned tenderloin on the apples, folding the thin end over to achieve equal thickness. Step 5: Use the plastic wrap to begin rolling the bacon and apples around the pork. After the roll is started, release the plastic wrap and continue rolling as tightly as possible. Step 6: When roll is complete, gently pull the ends of the twine from the roll and tie with loose ends. This step might require help from a second person until you tie a 2 or 3 of the pieces of twine. As I was thinking about this recipe, I wasn’t quite sure how to cook it. After considering my options, I decided to use the grill. I ruled out the oven because I think the bacon grease would have generated too much smoke for inside cooking. Using indirect heat, I grilled the tenderloin at 300 degrees with two burners on and the pork over an unlit burner. It reached 150 degrees after about one hour, but I highly recommend using a meat thermometer to assure you don’t undercook or overcook. Due to the inaccuracy of grill thermometers, start checking the temperature after 45 minutes. You can always continue to cook, but you can’t undo overcooking. I brushed the pork with the glaze a couple of times during the last 30 minutes. Our good friends and frequent taste testers, Bruce and Felix, gave this dish two thumbs up and blessed it as blog-worthy! I think you’ll enjoy the first autumn main course of Southern Boy Dishes. 1. Combine garlic, sage, salt, and olive oil in a small bowl. Rub mixture over all sides of the pork tenderloin. 2. Place a 14-inch piece of plastic wrap on a large cutting board. Place 8 14-inch strands of kitchen twine 1 inch apart on the plastic wrap. The twine should be perpendicular with your body. Place bacon strips in an overlapping fashion on top of kitchen twine. 3. Place apple slices in rows on bacon. Place tenderloin on the apples slices closet to you. Fold the thin end of the tenderloin over on itself to create even thickness. 4. Using the plastic wrap, begin rolling the bacon and apple around the tenderloin. Roll as tightly as possible. When you completed the roll, pull the ends of the twine from within the roll and tie to the loose ends. You might benefit from someone holding the roll while you tie the first couple of pieces of twine. 5. Bring apple juice to a boil in a small sauce pan. Lower heat and continue simmering until juice has reduced by half. Add apple jelly and continue simmering until completely melted. Remove from heat and whisk in maple syrup and mustard. Set aside. 6. Preheat grill to 300 degrees. Turn off one burner on grill and place tenderloin over unlit burner. Close grill and cook for one hour or until internal temperature reaches 150 degrees. After 30 minutes, begin basting with maple glaze. Baste again after 15 minutes and then again when meat is done. Let rest for 10 minutes. Slice and serve. Could I make this in the oven instead of the grill? Thanks for dropping by Southern Boy Dishes, Lauren. I considered the oven when I was developing the recipe, but I decided that the grease from the bacon would generate too much smoke for cooking inside. I’m totally speechless!!!! !………………….I made a pork and apple dish this week but it was SO boring compared to this and not near as gorgeous! This is a piece of art! Pork and apples combine so well, don’t they? This is a stunning dish — thanks for such a great recipe. This looks insane!!!! And by insane I mean absolutely delectable! Cannot remember the last time that I made pork tenderloin. Thanks for reminding me how delicious it is.. definitely inspired to recreate the recipe soon. I absolutely am loving the idea of wrapping it in bacon and apple. Looks awesome! Bill, this recipe is goes high on your Hall of Fame. I’m so glad that you showed how you tied and filled the tenderloin with apples and wrapped it in bacon. Wow! Pork and apples is one of my favorite combos of all time. The bacon is the cherry on the sundae…and the finished dish– the front cover of a magazine. Well done. Thank you so much, Debby!! I really appreciate your comment!